Baseflash is an advertisement supported program which can enter your operating system without your consent and then present various pop-up and banner advertisements. 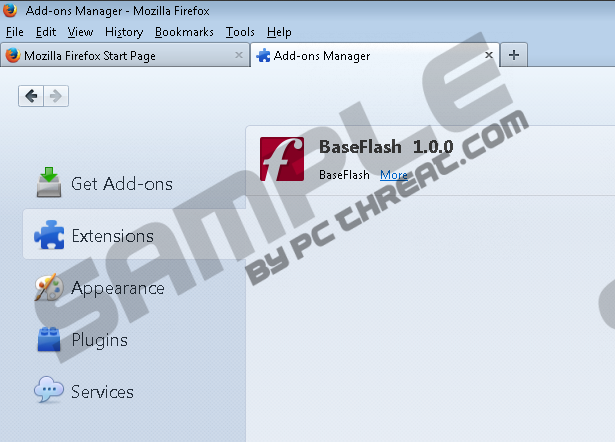 The official download page baseflash.com currently does not present an active installer; however, if you detect the program on your browsers, there is a great chance that it has been installed bundled with other applications. The browsers that are compatible with the plugin are Google Chrome, Mozilla Firefox, Opera, Safari and Internet Explorer, and if you operate a few of them, it is most likely that you will discover the plugin installed on all of them. Luckily, you can remove Baseflash from the system. There is no doubt that the main objective behind the clandestine Baseflash is to flood your browsers with advertisements. Unfortunately, these are not the advertisements you want to face. Some of them could offer you to install download managers, flash player updates, and other unreliable freeware. Just because the program is free, it does not mean that there are no risks involved. In fact, freeware might be used as bait to trick you into installing malware or visiting corrupted websites. This is especially dangerous if your operating system is not safeguarded by authentic security software. Even though Baseflash removal is not as straightforward as it could be, you certainly can delete this application from your operating system. If you choose to get rid of the program manually, make sure that you follow the removal guides below and then delete the remaining components in the Baseflash folder. You can also choose to use automatic malware removal software. This is your best solution because authentic software will also locate and delete other potentially dangerous programs which may have been installed together with the suspicious extensions. Click Tools, then Extensions and locate the undesirable one. Now click the recycle bin icon and select Remove. In the Tools menu select Manage Add-ons. Click Toolbars and Extensions and Disable the undesirable plugin. Click Close. Quick & tested solution for Baseflash removal.